четвъртък, 20 септември 2007 г.
Vihren is the biggest peak in Pirin mountain. You can see Koncheto(The Foal – long and narrow cliff with safety cable along it) nearby – probably the most popular place in Pirin. Vihren is 2914 m hight. This is almost 1000 meters higher then the hut with the same name. You can reach the hut by car or by minibus that you can take from Bansko. The minibuses leave from Bansko at about 8, 14 and the last one is at about 17 o'clock. The ascent to Vihren takes 3-4 hours and at least one more if you want to go to Koncheto. There are two ways up. The one is shorter but steeper. Second goes round among the Kazanite – a place with a enormous cliffs around and impressive echo. This way takes more time. The first way is easer if ascent to 2914m can be easy at all. Except these main ways there is another roundabout way. It is appropriate if you want to spend more that one day in the mountain. 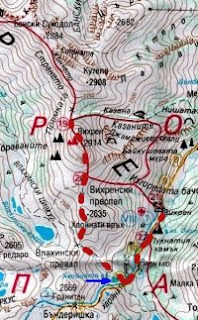 In that way you have to fallow the marking into the Sinanica hut and leave it when you reach the Muratovo(or Hvoinato) lake. The lake named Muratovo is a big and beautiful lake. Usually there are many grazed horses in the summer there. There are a nice places for spending the night with tent or even with sleeping-bag if the weather is fair too. After you leave the marking you must continue the journey to the right and try to reach the ridge you see in that way. It will take ane hour. If the weather is bad and there is a fog there is a danger to loose the way and crack yourselves. Reaching the ridge you must turn right and go on it. Beyond you can see the Vlahinski lakes. Along the way you may go over or skirt the peak named Hvoinati. After that you will get to a saddle in front of Vihren where you will join the first of ways which were mentioned before. At the weekend and if the weather is fine there are many tourists on the peak. There is an imposing view over four corners of the world. Posted by Unknown at 16:13 ч.